The presentation of a design has a vital role to play in the acceptance and approval of it by the client. In the field of designing, a graphic designer has to take a lot of work on his nerves; otherwise he can never perform well out of pressure. Art and design requires appealing looks to seize the attention and grab the onlookers. Whatsoever a project really is, if it is not presented in an emphatic and impressive way, it would for sure go to trash of no consideration. A messy and outrageous thing is never liked and admired; it is always pushed back in the ditch. Customers buy the fabrics, accessories and dresses what give them a fantasy—an allusion that they would look good in them. It is about the presentation customers go after; it is a kind of good illusion to satiate the aesthetics of the people. 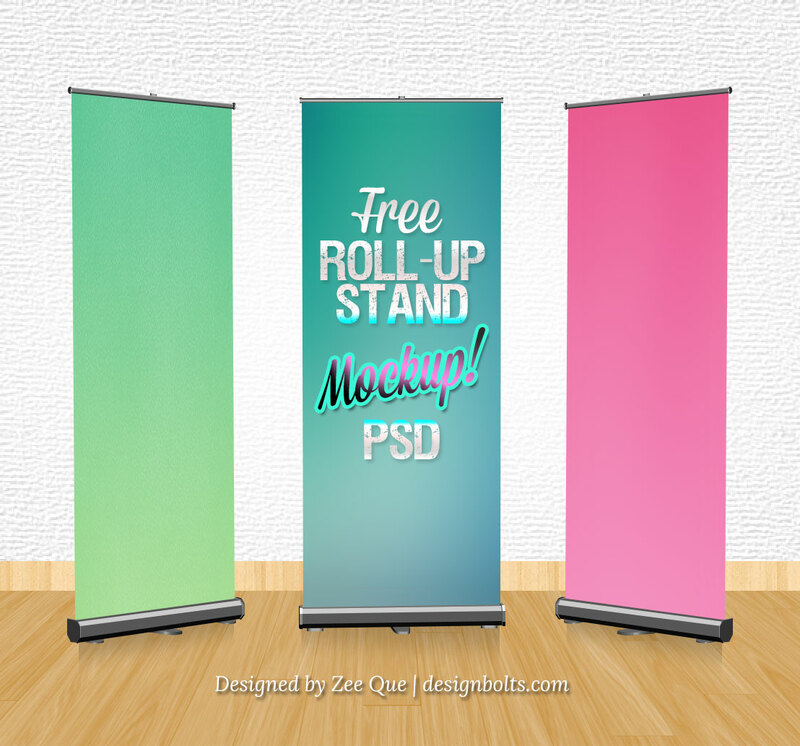 Today I’m bringing forth a free roll up stand Mock Up PSD that you can give to your client and the presentation would do full of its job. This mockup will be a great help for all the graphic designers to live up to the expectations of the clients. After all the presentation of the design is all what counts in a project. You need to give your client an impactful expression of the respective enterprise. Have a look . Subscribe us for more free Vectors and free icons. Note: Roll-up Banner Size that fits on the mock-up is 4 x 10 ft. This is a vecter PSD file you can resize it as per your requirement. To place your design you need to double click on the colored layers [Place your design] then place your design and save the file. All done! Everything works fine in CS6. Please open in later version. Mockup works fine in CS4 to CS6. Thanks very much for the download. I’m independent at the moment, and I can’t tell you how hard it is to find specific mockups that REALLY ARE FREE. I don’t have a lot of money for stock credits, etc., right now, so thanks! Thanks Ryan for liking… Don’t forget to Subscribe to get more quality mock-ups in future. Thank you very much dear, its really a valuable effort. May we ask if you do have this size.